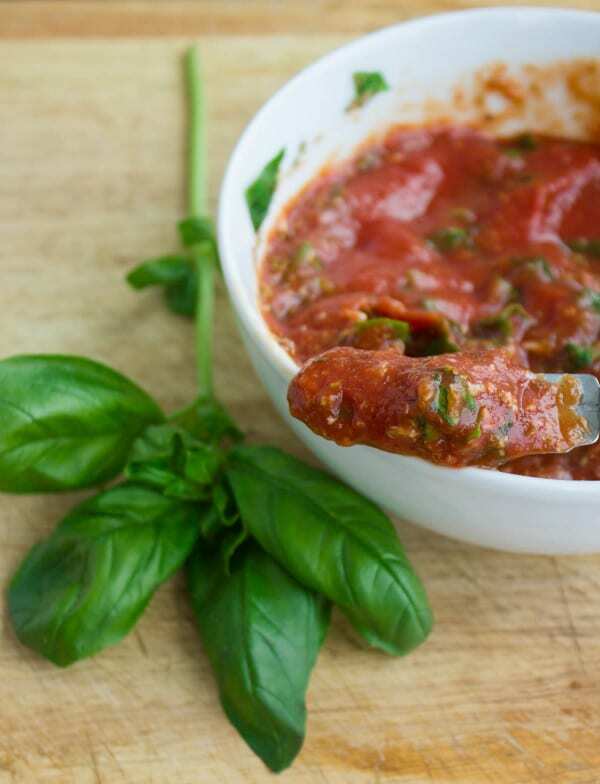 This easy no cook pizza sauce recipe will make you wonder why have you ever cooked pizza sauce before.. It’s loaded with flavours — garlic, basil, oregano and parmesan. It tastes fresh and incredibly rich, it has a beautiful bright red color, and it all comes together in 3 minutes! 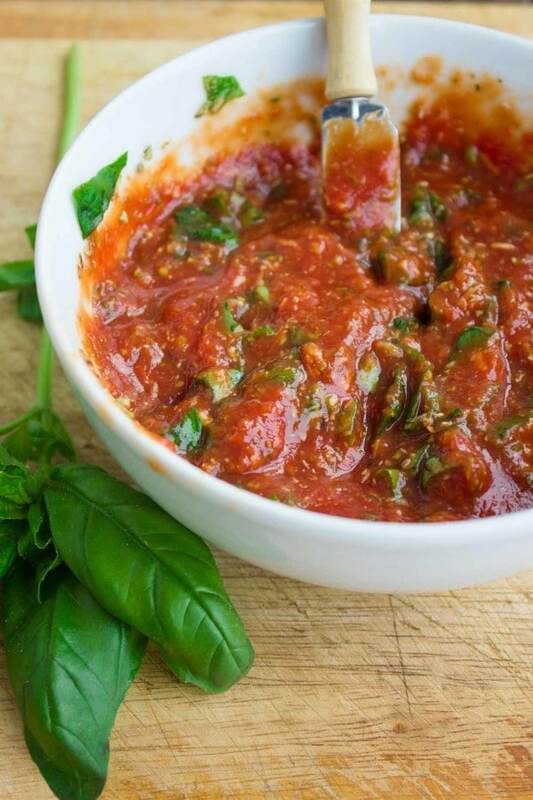 This sauce is every pizza lovers’ dream! It’s a recipe you can’t miss! When I was young, we visited Italy and enjoyed quite a bit of pizza as far as I can remember they all tasted the same.. Then I visited it again a few years ago and went for the pizza, and that’s when I realized how different pizza tasted in different areas of Italy, even the shape and serving style of pizza is different. And then I also realized that Italian pizza is quite different than American-Italian pizza. Most of the differences I think come from the dough and baking. 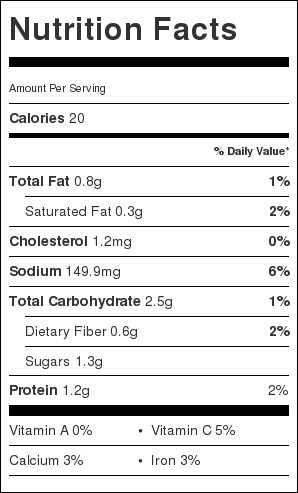 Pizza sauce however, is quite similar in most pizzas. 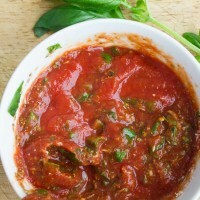 Just like marinara sauce, some might taste more garlicky or some may have onions, some are cooked down close to a tomato paste and some are really thin almost watery. After trying many sauces over the years, I have completely and totally adopted this no-cook sauce! The simplest things in life (and food) are sometimes really the best. So here’s why and how I’ve reached this conclusion: the fact that this sauce doesn’t cook makes for a fresh bright tomato taste, the fact that the garlic and basil are not cooked too gives a stronger flavor to the sauce. And the use of canned crushed tomatoes gives this sauce the perfect thickness. 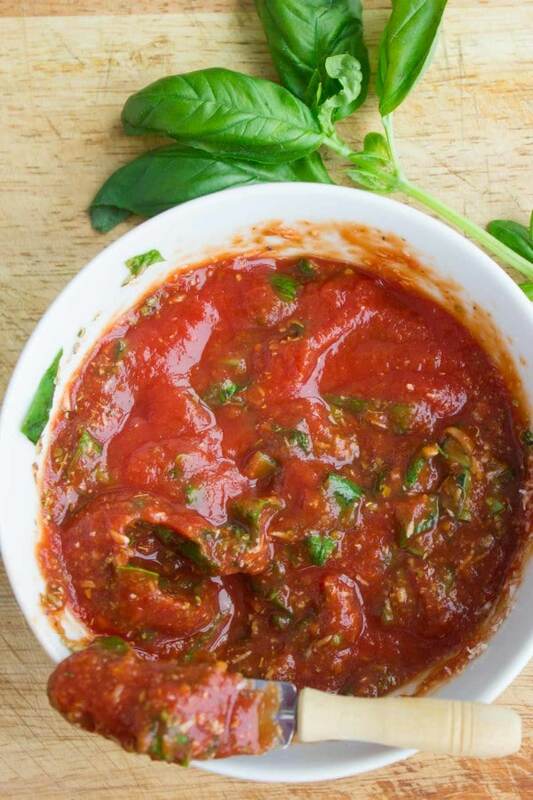 The versatility of this sauce is great—you can add more garlic and less parmesan if it’s your taste, sometimes I add basil pesto for extra basil flavor, and sometimes fresh oregano if I have it on hand..The convenience is unbeatable- this sauce is prepared in 5 minutes and ready to use right away and any leftover is stored in the fridge for 2 weeks or frozen for 2 months. Try this sauce on your next pizza and you won’t ever go back! Enjoy!! 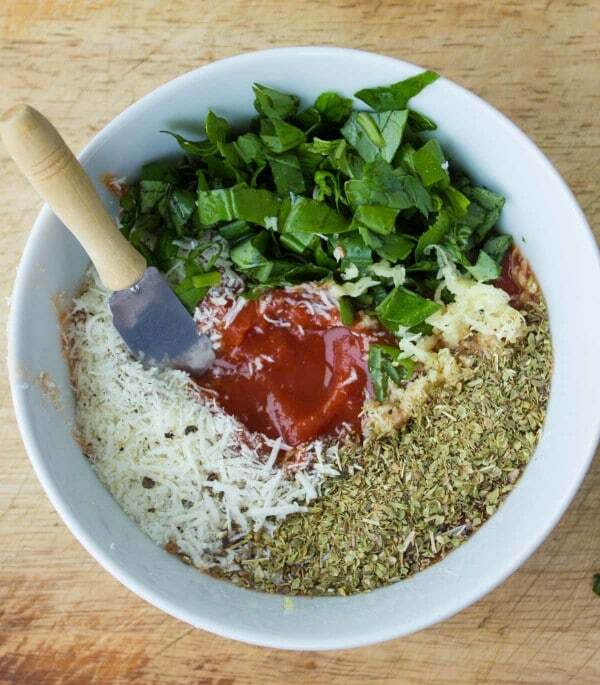 In a medium sized bowl, add all the ingredients ad mix them well. Let the sauce sit for a few minutes and use it right away.